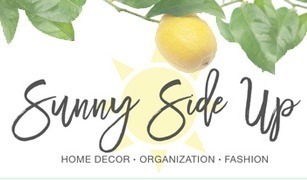 *This post is compensated by Walmart and affiliate links are used, but as always all product selections and opinions are my own! 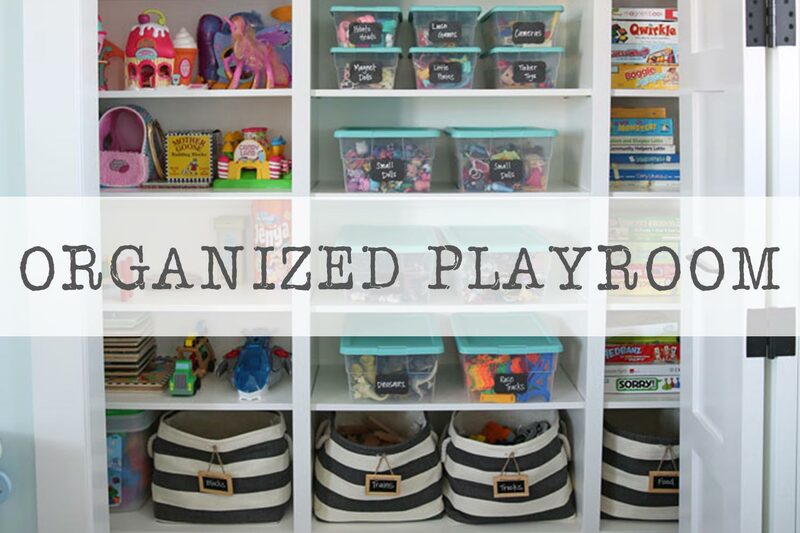 I’m sharing some organizing progress with you all today! YEA. Attic and office organization to be exact. But before I jump into that bag of chips, I have to quickly say that blog posts take me a long time to put together. This is in large part because I have issues with taking WAY too many pictures. Way too many pictures means I have to spend extra time sorting, selecting, editing, watermarking.. preparing the pictures to post. Taking less pictures is something I’m really going to work on this year. Ha. This post is picture heavy! As many of my posts are. Grab a snack. 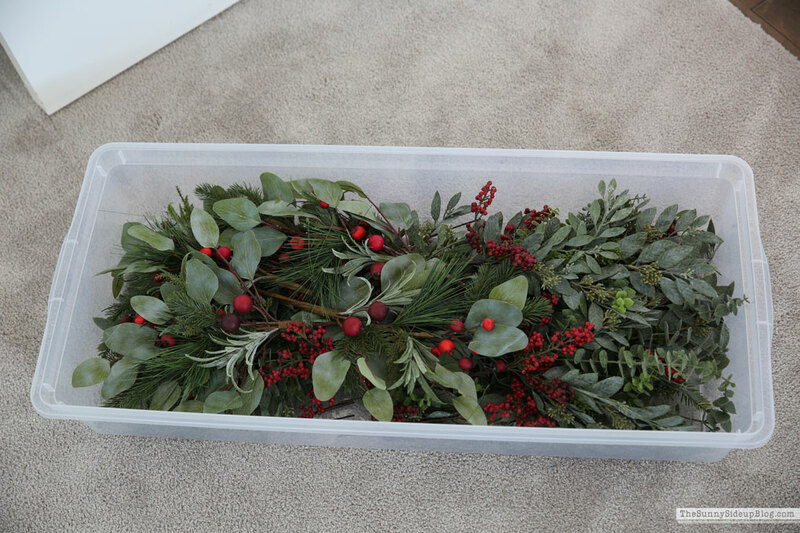 I had so many questions about how I store my Christmas decor after the holidays and yes.. I realize it’s now February and not on your mind anymore. But I spent a good part of January organizing my attic and wanted to share my progress regardless! 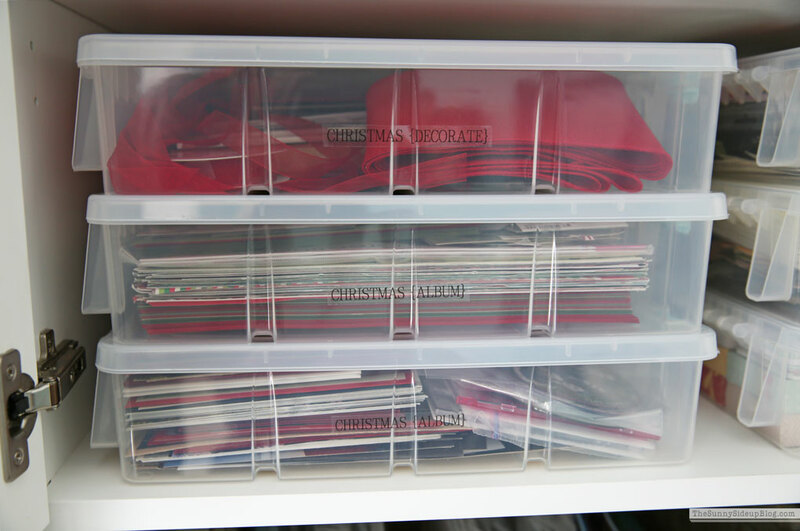 Soon after Christmas I ordered these clear Mainstay boxes from Walmart and got to work sorting and purging ALL the things in my attic down to only the things I really love, use and wanted to save. 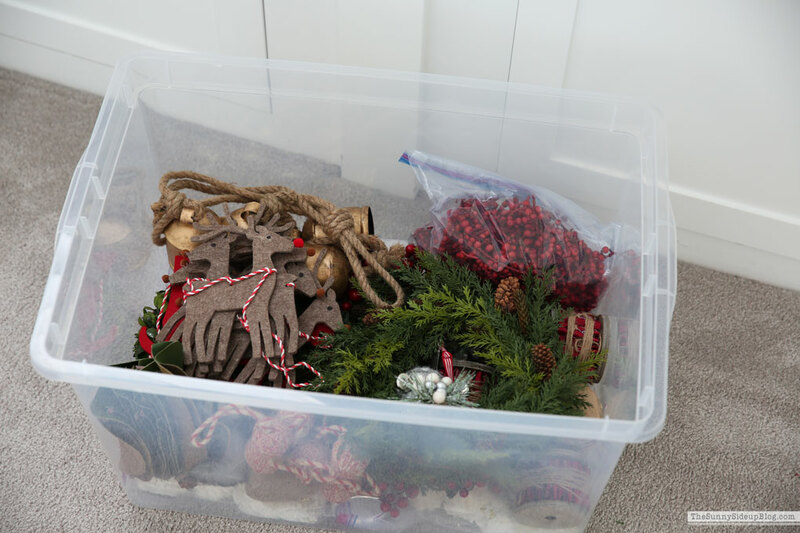 I quickly realized that I love, use and want to save a lot when it comes to Christmas decor. 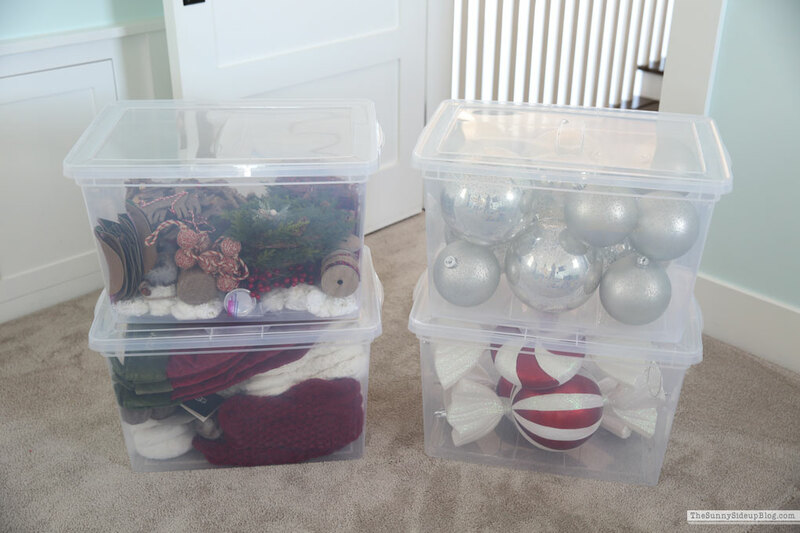 :) Clear containers are my favorite when it comes to storing items like this because then I don’t need to label everything and I can easily see what’s in each box when it’s time to decorate for the holidays again. Walmart has so many storage options at a great price! 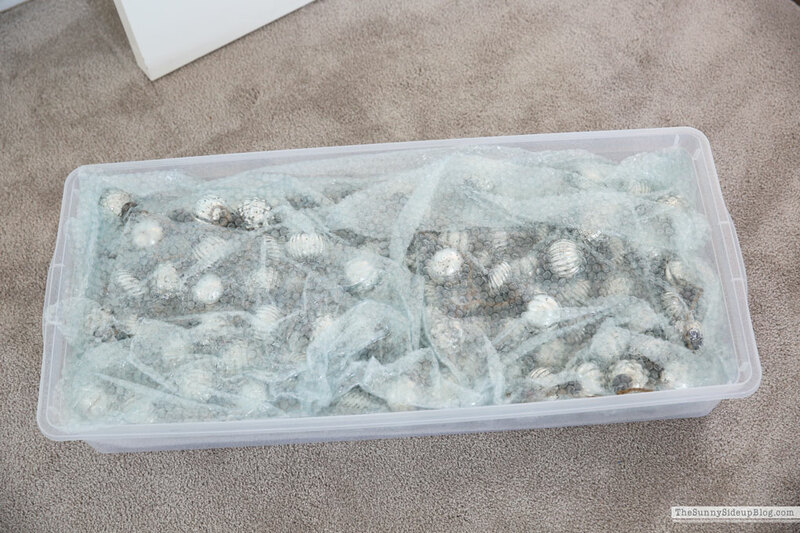 This set of 68 quart clear boxes was perfect for most of my items. 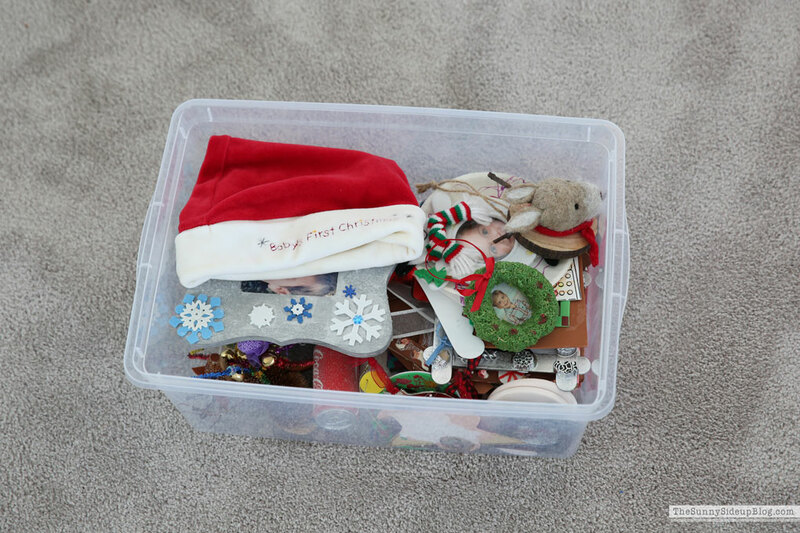 I used them to store large tree ornaments..
and one box I used to store keepsakes from my kids’ baby/toddler years. I have to be honest in telling you that this is the one thing I struggle with when it comes to letting things go. 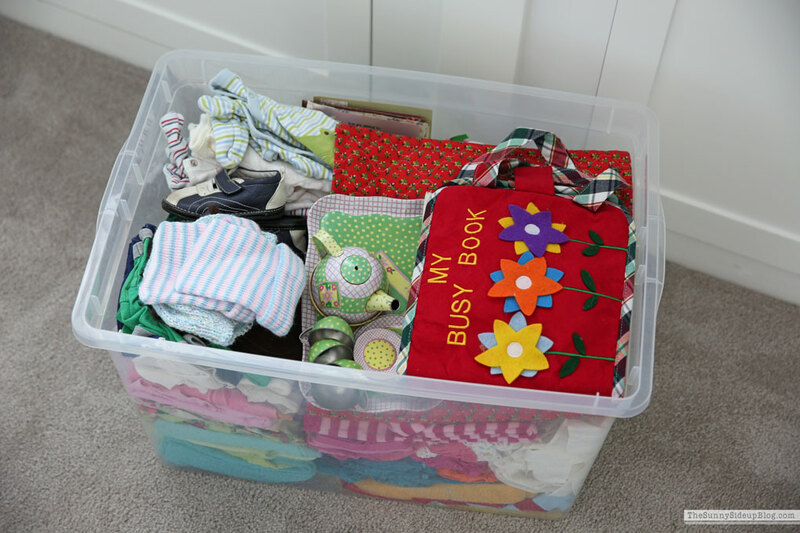 Other items I can ruthlessly purge and not think twice, but I struggle with letting go of my kids’ baby stuff and probably still saved too much. If you saw how much I started with you would be proud of this one box. Progress for now! 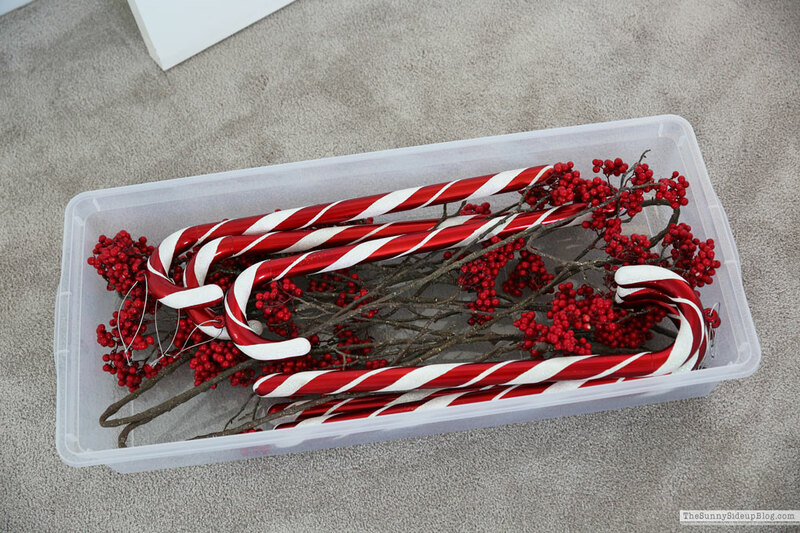 These smaller 17 quart clear boxes were perfect for grouping other similar holiday items together. I used them for things like my reindeer..
and the keepsake ornaments from the kids. 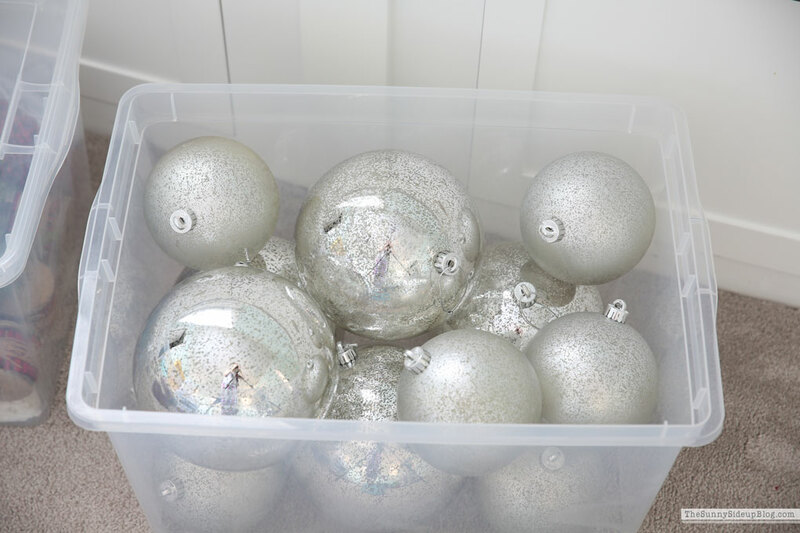 Then I used these under bed clear boxes for longer Christmas tree decorations. They were perfect for all of my greenery too! So here is the “after” of my upstairs attic space. Do you love that my outdoor deer made perfect wreath holders? Who knew? ;) I would share the “before” of this space if I had a picture of it, but it scared me so much I didn’t photograph it. Let’s just say you couldn’t comfortably walk in this space! It was bad. I’ll share more pics I took at some point. 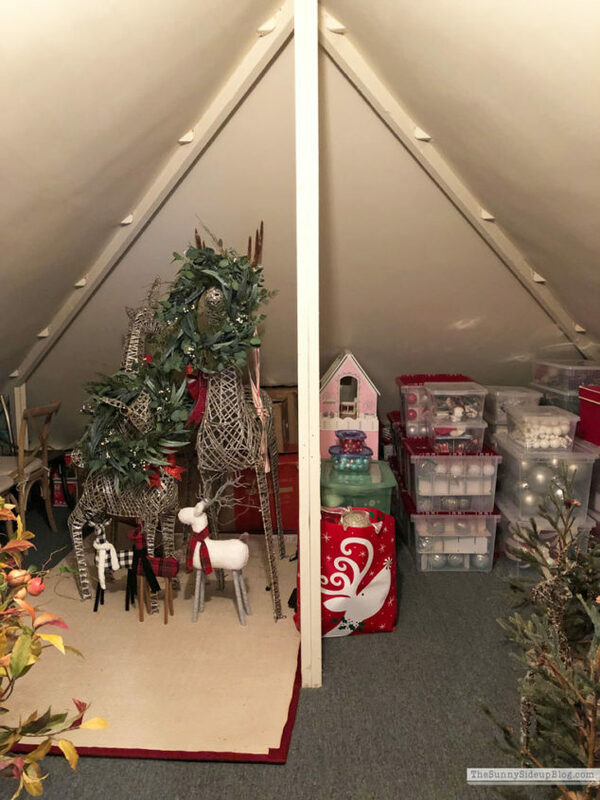 The left side of my attic is all of my seasonal decor and keepsakes and the right side is ALL Christmas. 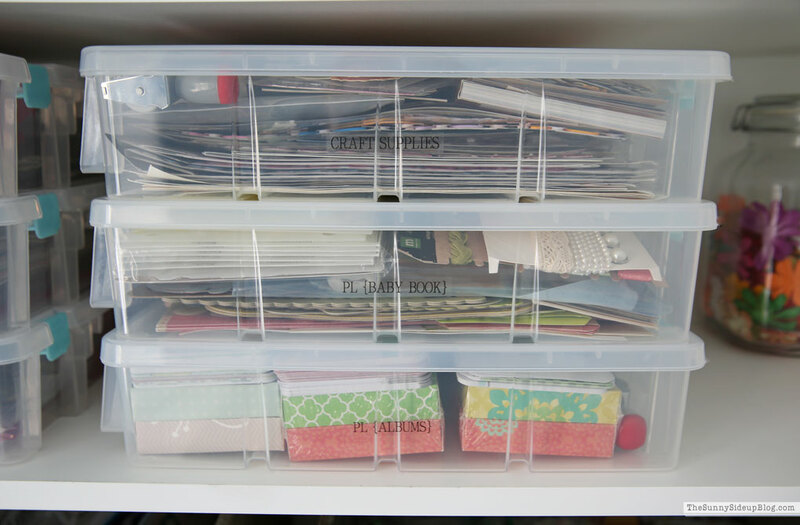 My new clear bins were a perfect solution to hold the items I love and wanted to keep! 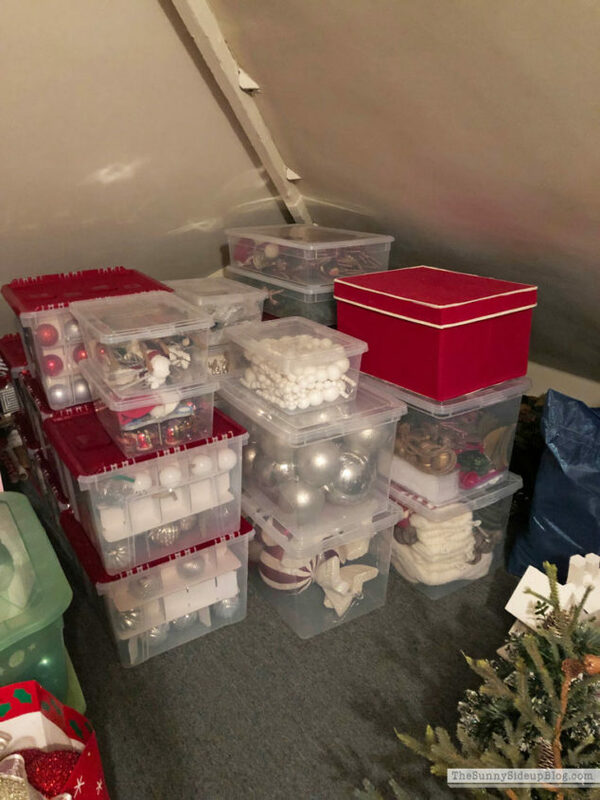 I combined them with the ornament boxes I’ve had for years and love having all of my holiday decor so streamlined and organized! Next year will be an easier process setting up and taking down for sure. Next space I’ve been chipping away at.. for years! My office. Oh man. This space has been hard for me! 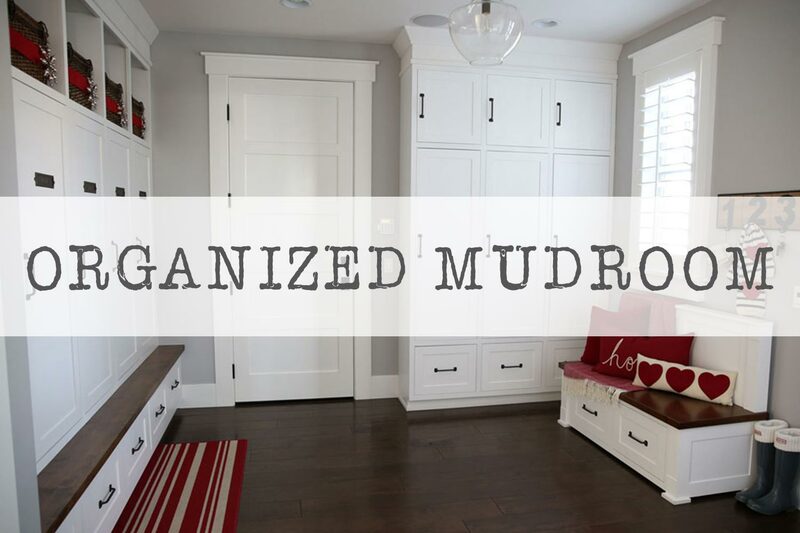 It has been “sort of kind of but not really organized” for years. I finally decided to go through the things I have been putting off going through since we moved into this house 5 years ago and just GET IT ORGANIZED once and for all! But at last it’s DONE! My office is completely organized. (Angels are descending!) My cupboards that initially looked like this. Now look like this. Ahhhh! I can’t even tell you how happy I am to have this project finished! 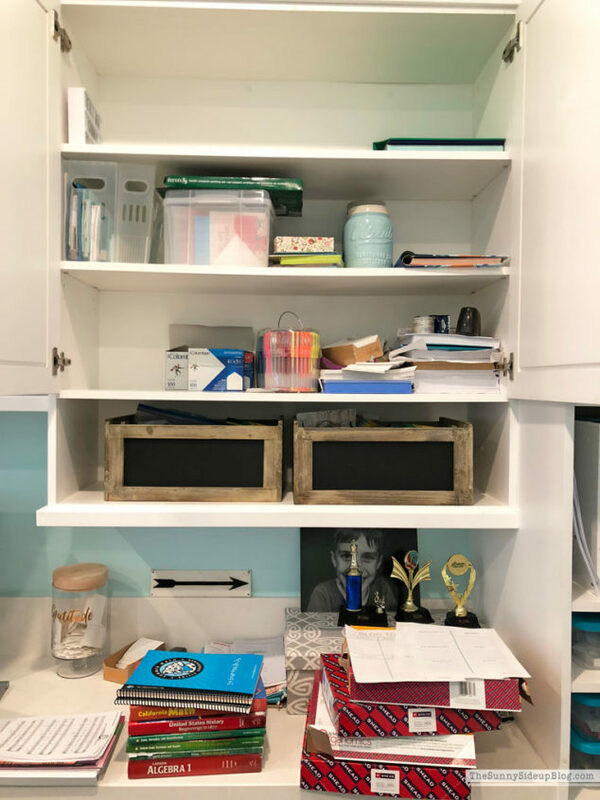 There are too many pics to share of this space now so I’ll write a complete post on my organized office soon, but I have to share this one cupboard first because I’m so excited about! For a long time I didn’t sort through random craft items in this room because I wasn’t sure how to organize them best. 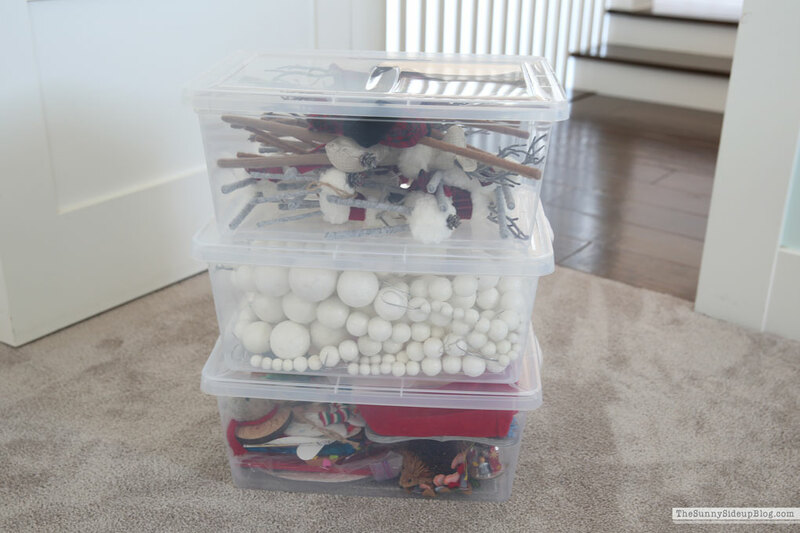 When I discovered these cute Craft Supply Boxes I was thrilled. PERFECT solution! I ordered 12 and got to work! They are the perfect size for ALL the things I needed to store but wanted separated. They were just a tad too big to fit in this cupboard facing forward so I turned them sideways and labeled everything. They stack so nicely and getting rid of the bulky boxes that were holding some of these items saved so much room! Those of you who have followed my blog for years know that I used to be really into scrapbooking. I had so many scrapbook supplies that I finally said good-bye to because I just don’t have the time to spend on pages like I used to. 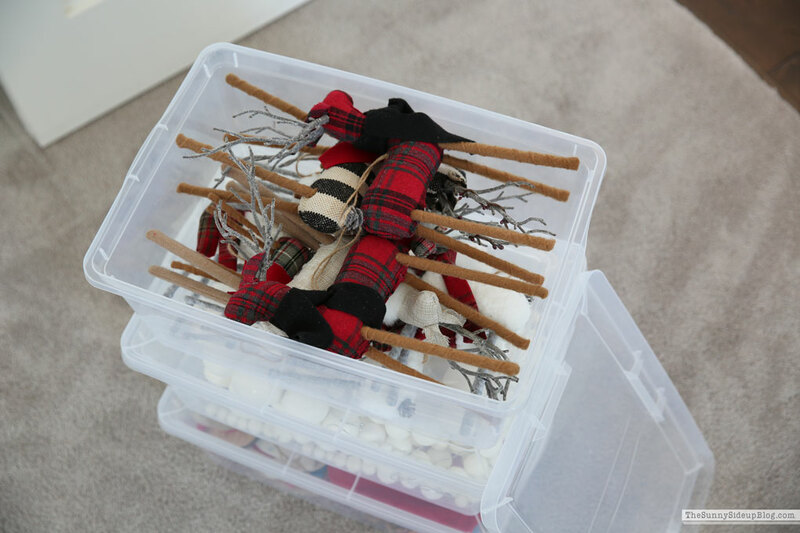 I did keep some items I’d like to still use and some random craft items I know my kids will use for projects. I still love scrapbooking, but know that if/when I do start working on family albums again they will definitely be simple! I even have one empty box for a future project.. score! 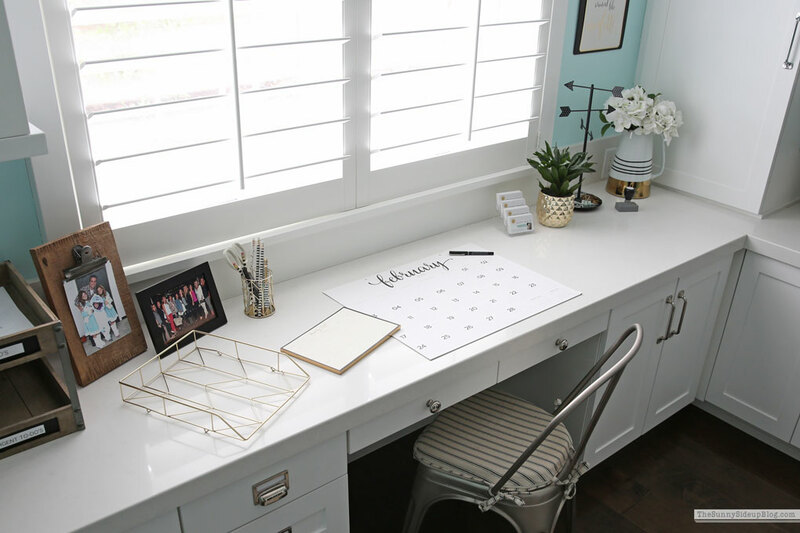 After getting my cupboards in order I felt the need to spruce up my desk with a few fun new accessories! 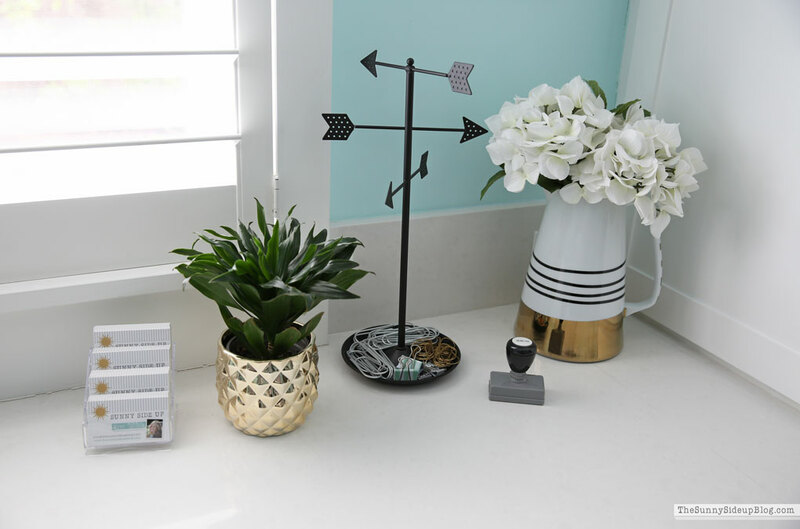 So in love with this gold desktop metal tray! And the matching pencil cup. 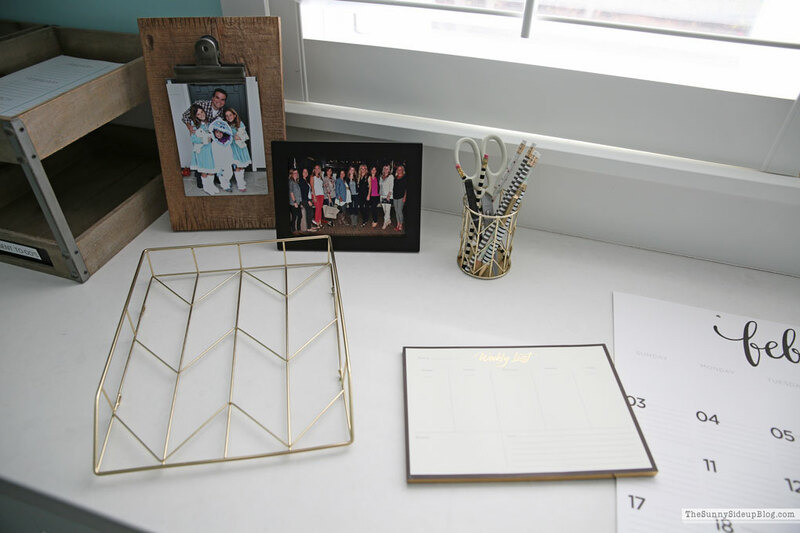 I’ve been using the tray to hold my planner/printables. 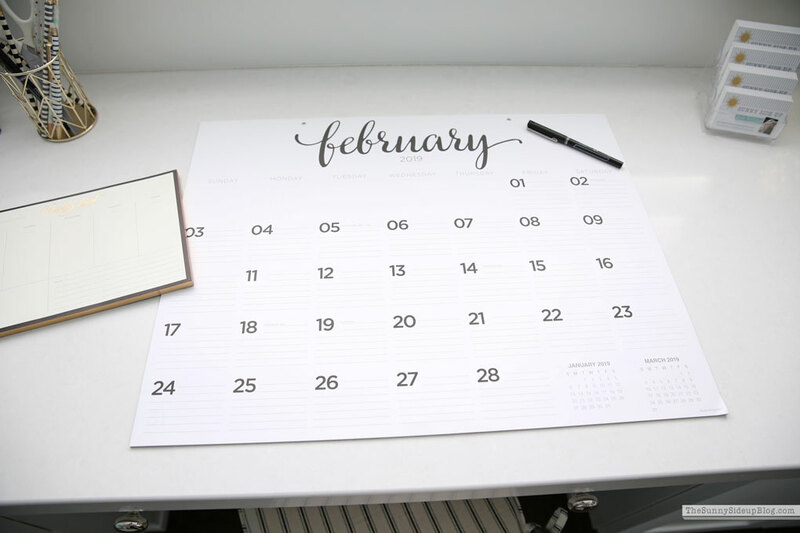 I also love having a large desk calendar to write reminders on that I’ll see every day. The font on this one is so cute! A cute and clean desktop. 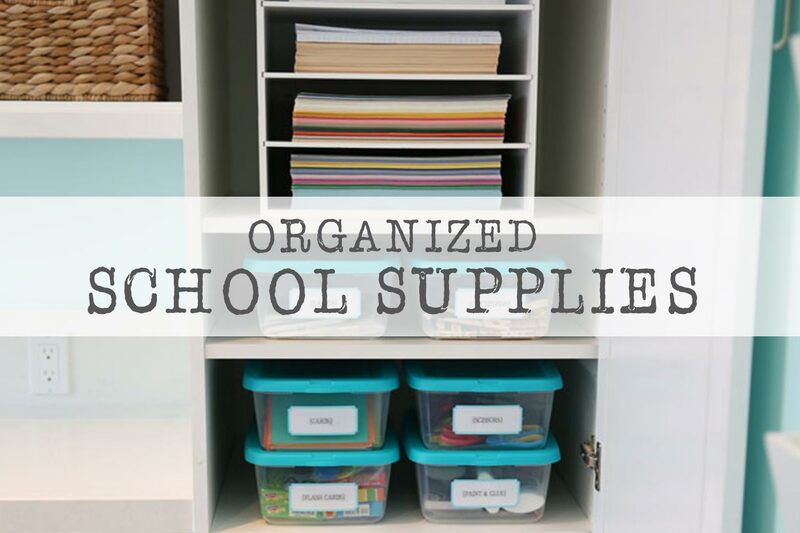 And organized cupboards for a new year. Well.. a month into the new year. But a new year nonetheless. My work here is done! Time for that bag of chips. Oh gosh, I’m so envious of that large attic space! You can put full size reindeer in the their! Wow! 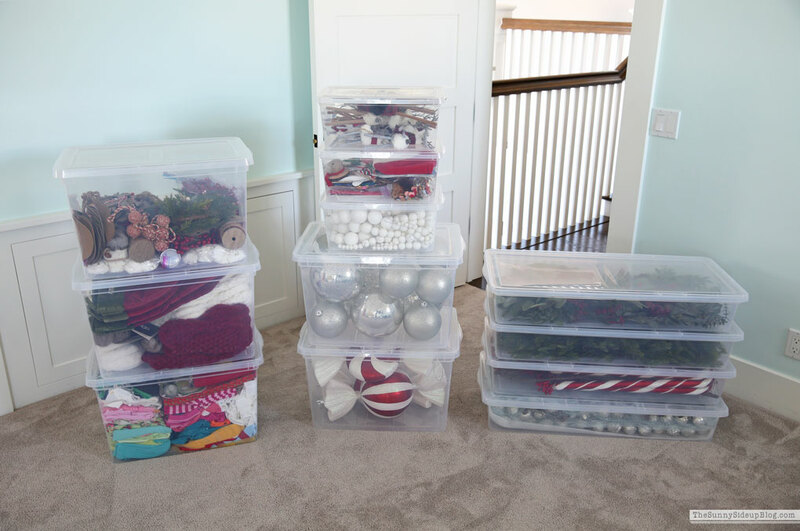 I’m very proud of you for going through all that stuff and consolidating the decorations and decor into that containers you did. It looks fabulous. I’m sure you feel a million times better having that job done. 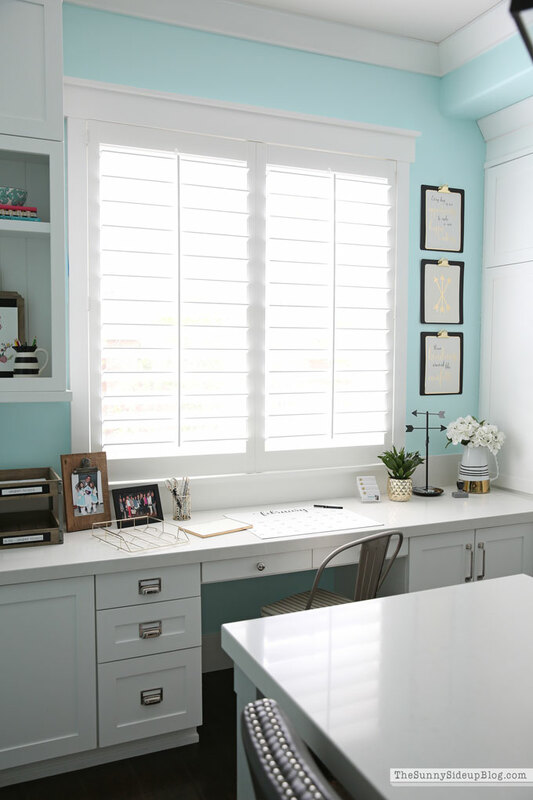 Your office looks great, too., I’m envious you have a dedicated room for that as well. 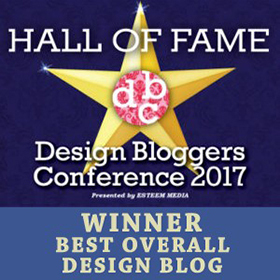 Congrats for going through your scrapbooking supplies. I completely understand different seasons of life allow for certain activities. I used to digi scrap, but now am huge into making cards. Not enough time available to do it, but I get it. 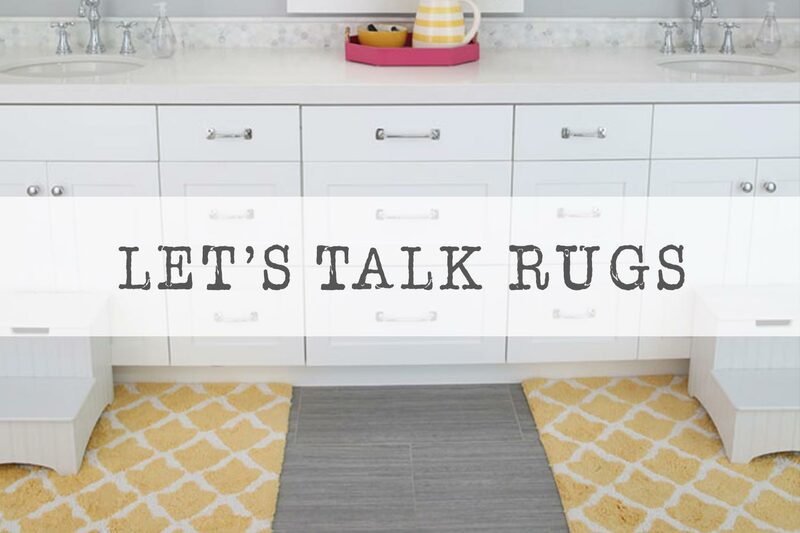 Your spaces look great and I’m sure a huge weight is lifted off your shoulders. Well done! Happy Wednesday. Hope the rest of your week is fantastic. 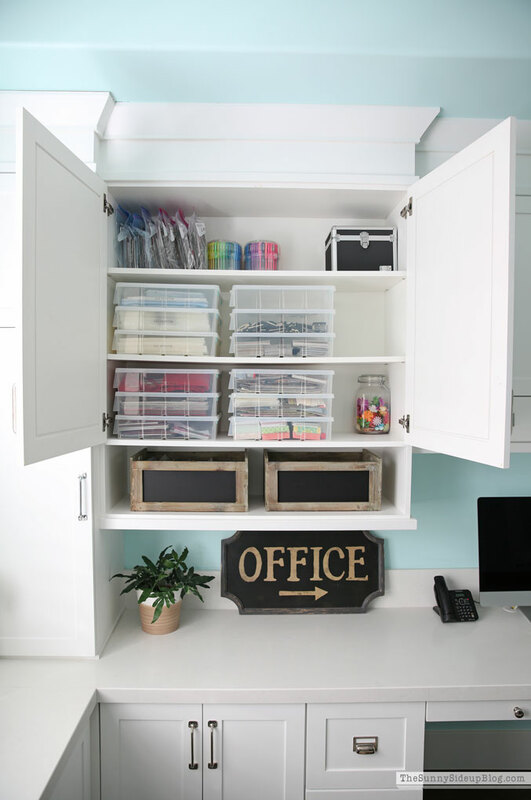 You’re organized office cabinet looks great! 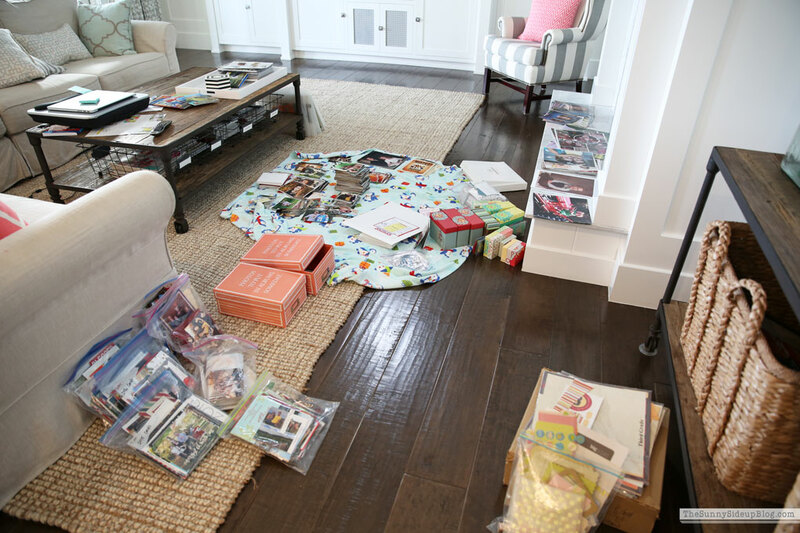 I would love to hear how you organize all your pictures. How do you store them digitally? Also, do you still make any type of family albums? If so, what do you use to create them (Shutterfly, print out and put in albums, etc.)? 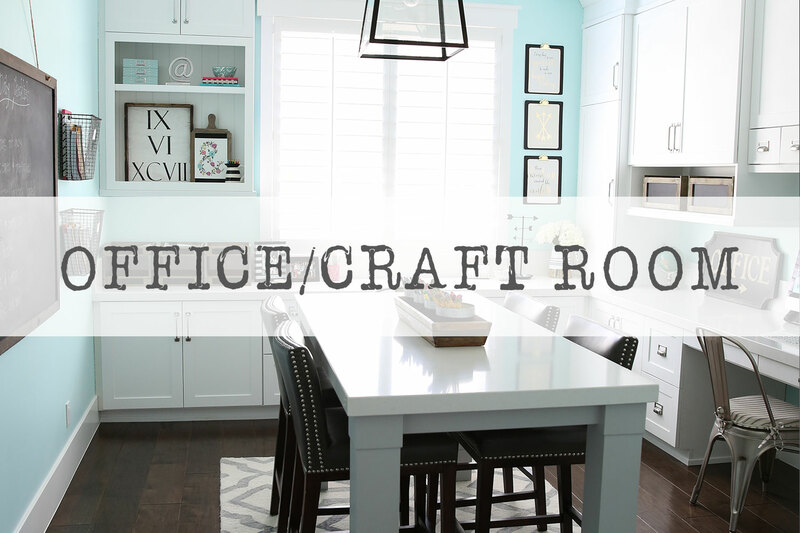 Reorganizing my craft and office space is on my goal list so your ideas came just at the right time! Beautiful job, Erin! Excellent work – very inspiring! 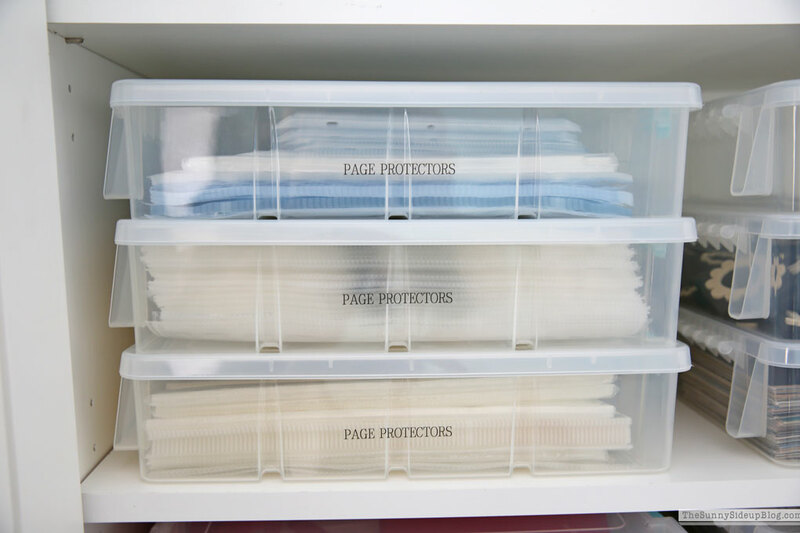 It’s so hard to find great storage that isn’t plastic – especially because who doesn’t love the benefit of clear storage so you can actually know what’s inside! 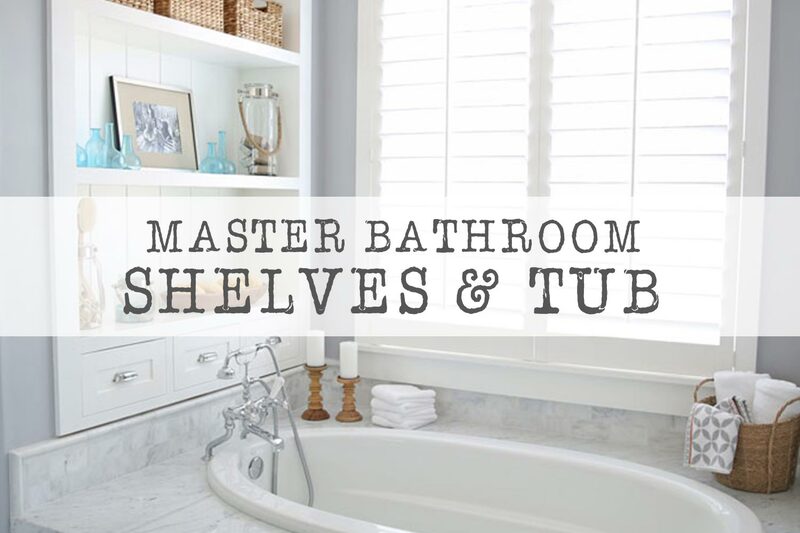 Such a tough thing but I encourage you, and other storage influencers, to really take on the challenge of finding non-plastic solutions as people are buying so much plastic based on your recommendations. 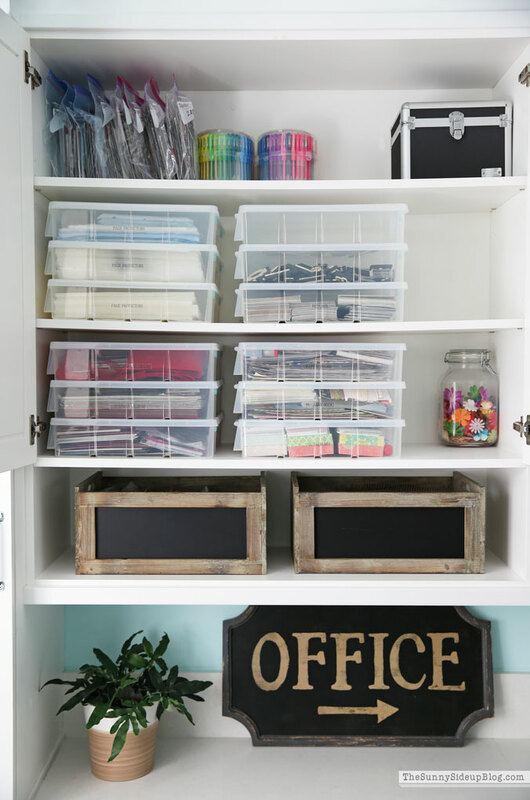 I totally don’t mean this to sound shaming at all – I struggle with it myself and have a couple of those plastic bins in my shed – but just want to start the conversation because I see so much plastic being promoted by organizing/styling influencers. Thanks for your constant inspiration in the home. 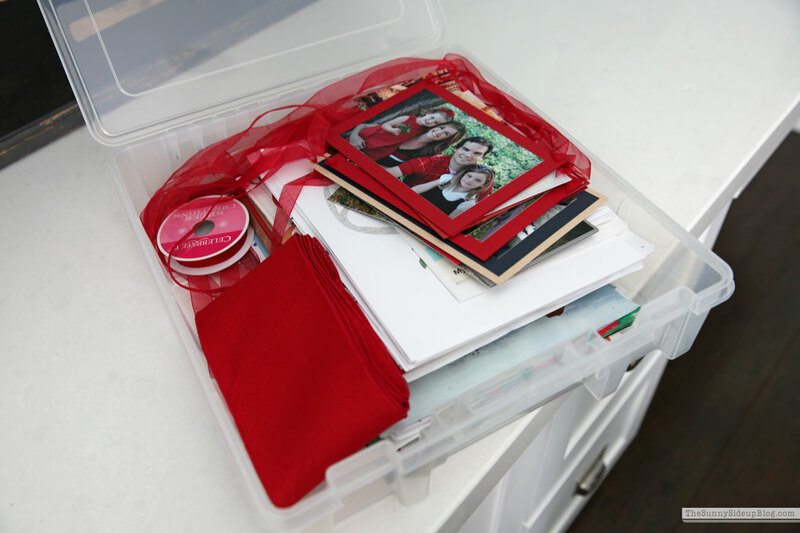 I also let go off all the scrapbook paper and supplies I was holding and knew I might never use. I donated it to a day care center for military children. Sometimes less is better! 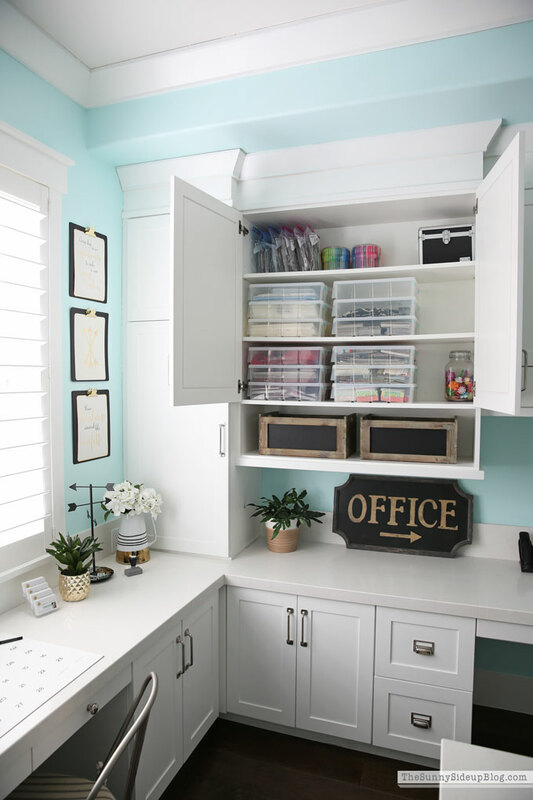 Such a tidy space! 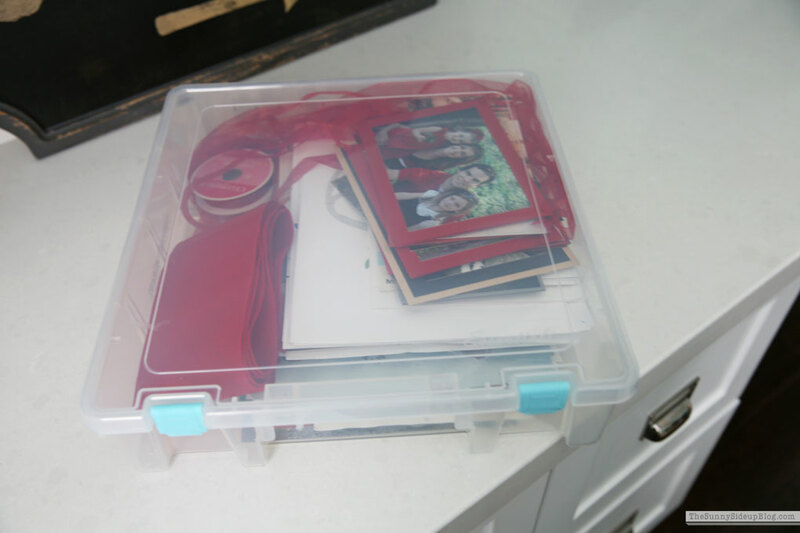 What will you be doing with your family pictures in zip lock bags? I have gobs and gobs of albums that are stacked and there must be another way to organize the pictures without the bulky albums. Since going digital I’ve created albums on those pictures and they are such space savers for sure. I just don’t know what to do with the old non-digital photos. Wow! What an attic space. I love your clear bins. Ive been wanting to get “same color” totes for my Christmas decor. I love it when I have an empty container in my sewing room. High five! You have been working hard. Looks great. I love the stools in your office! Would it be possible to find out where you got them or who they are made by? Great inspiration! 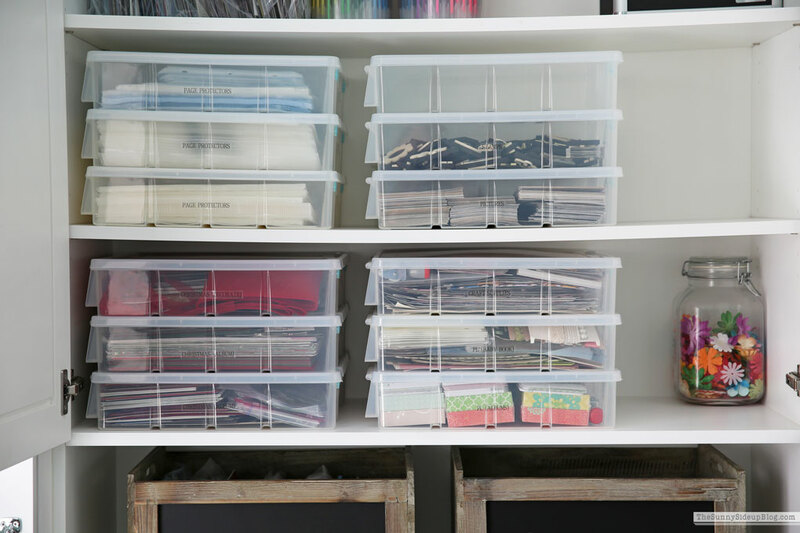 I used to do project life too-in fact, I discovered it from your blog! I switched years ago to the project life app and I LOVE it! 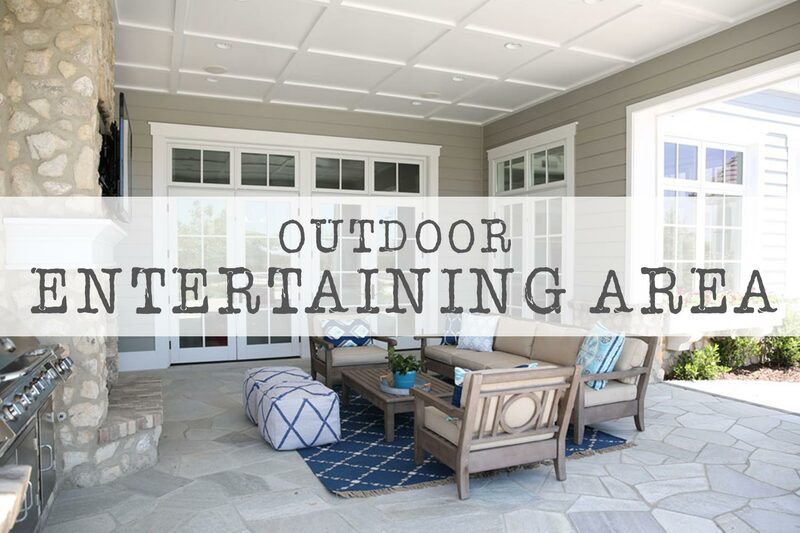 So simple and easy to use and only takes a few minutes. 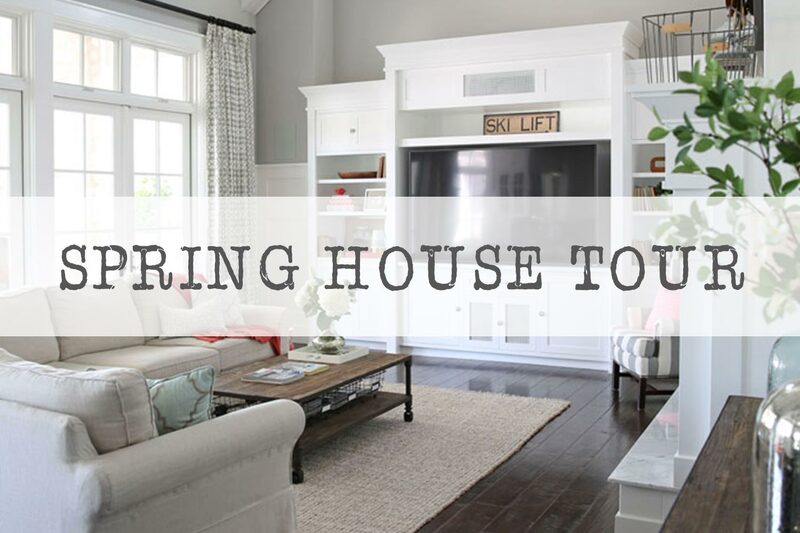 It’s definitely worth checking out. Now I just havd to pass on all my old scrapbook supplies-I’m curious if you found a good place to donate craft supplies? 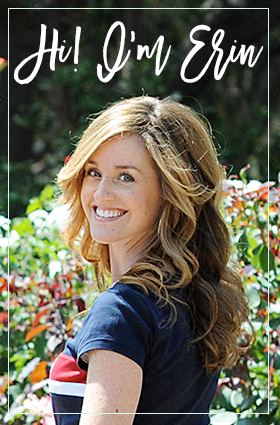 I spy Becky Higgins project life cards! 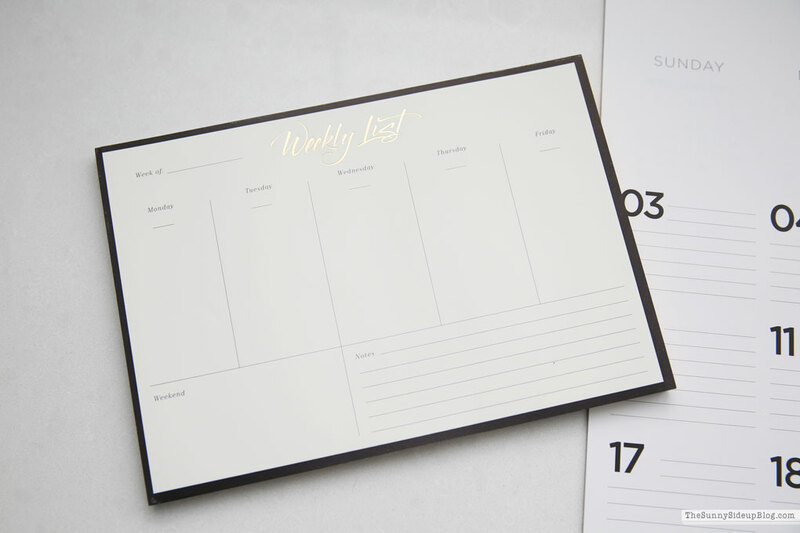 I was big into Project life for many years, but then I stopped in December 2017. I now use the Chatbooks app and it’s a breeze. I print a 6×6 book every month and boom done! I can even put some journaling underneath the pictures! I was all caught up for 2018! Best find ever! Yes! I love the Chatbooks too Amy! I have a lot of friends who use them. So smart! 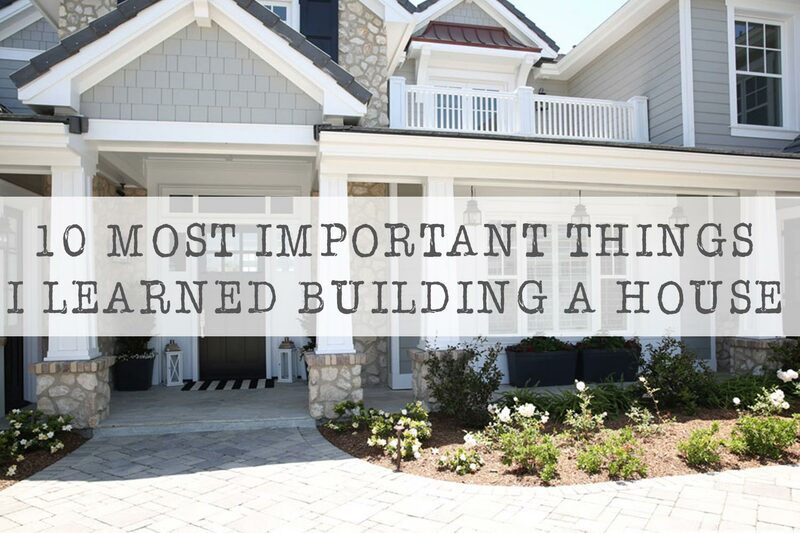 Do you make one for each child separately per year? Or a family book that you print multiple copies of? I LOVE how your office turned out. It makes me want to re organize everything I have. I would love to know your secret to storing school papers. I have 3 girls, 2 that are in school and one that is about to start that I feel like I am saving so much more than i should be. I apologize if you already talked about this previously. 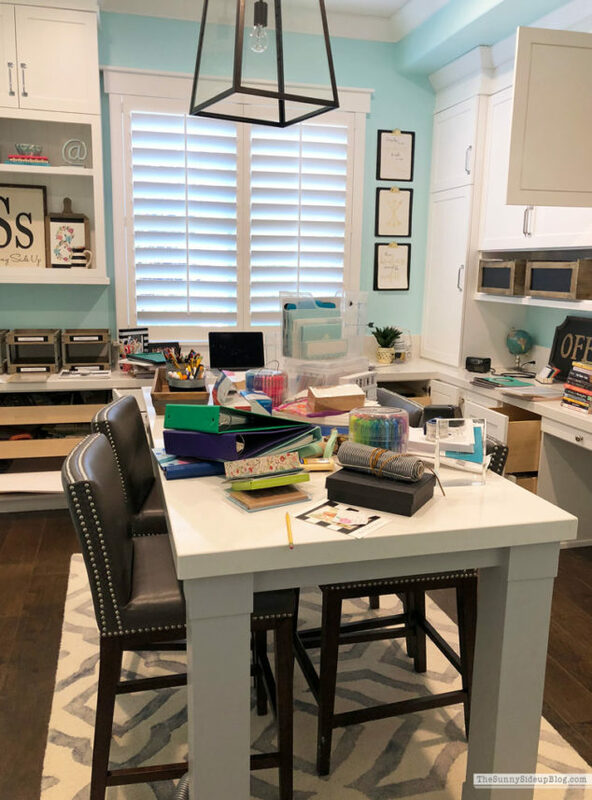 Your office is my favorite room in your house! My space is much smaller, but I use yours as inspiration. 😊. I’d love to hear more about hoe your organize your pictures on your computer.